Two ramps at the Capitol Reflecting Pool, made to keep ducklings from drowning, were so successful last year that they're being brought back this spring. See photos. 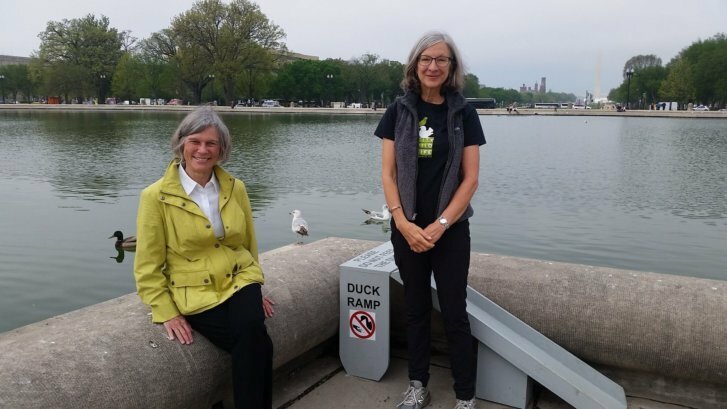 WASHINGTON — Two ramps at the Capitol Reflecting Pool, made to keep ducklings from drowning, were so successful last year that they’re being brought back this spring. Ducklings were too small to get in and out of the pool, due to the two-foot high ledge surrounding it. “This huge curb — they can’t navigate it, especially the young little ducklings,” said Anne Lewis, president of City Wildlife, a D.C. animal rehabilitation organization. City Wildlife worked with Architect of the Capitol to come up with the ramps after getting complaints from the public of seeing ducklings in trouble and drowning. Lewis said the minor issues with the ramps have been worked out. Sides to the ramps were added to keep the ducklings from falling over, and more traction has been added to the surface to keep the ducklings from slipping. During the spring and summer, the Reflecting Pool sees about 20 to 35 families of ducks, according to April Linton, who heads the duck program with City Wildlife. Linton said tourists take more pictures of the ducks than of the Capitol.